the real estate agent had all cards on the table, with full knowledge/disclosure inherent in their transaction. The "average Joe", however, may have purchased with a stacked deck (with both real estate agents,or the single real estate agent representing either the seller, or no one- dual agency) knowing that there was never an interest in "best interests of" Joe buyer. Yup. Sounds like a train wreck to me. What on earth is WRONG with real estate agents that don't comprehend disclosure, the need for it, and the legal ramifications of being either ignorant or lazy about it? Not seeing a big bubble is one thing; not seeing an ethical way to operate in the buyer and sellers behalf in a real estate transaction is just plain irresponsible. I was a loan officer during the early part of the "bubble" when funny money loans just started. I had people come to me for financing homes far outside their price range, because they had learned about those loans from other people and they insisted on that type of loan. When I explained the pitfalls of the financing they became very belligerent with me and insisted that I was wrong. I told them to go somewhere else because, although I had those loans available to me, I would not write them. I lost a lot of business - and many of those people are upside down now. I would argue that it's their own fault - they wanted more than they knew they could afford and knowingly decided to go for it anyway. While lenders are certainly to blame for this mess, I believe for the most part it was people's own greed that has caused them their troubles. Frankly, I've never seen a Realtor who could sell anyone anything they didn't already want to buy - there are specific disclosures that each Realtor is required by law to provide to buyers and sellers - if they choose not to pay attention, who's to blame? I pretty much agree with Dawn. I was doing websites and working for Realtors before, during, and now after the bust. I don't see any blame on the Realtors. It was like fishing in a bucket full of starving fish. All they did was answer the phone and take orders. 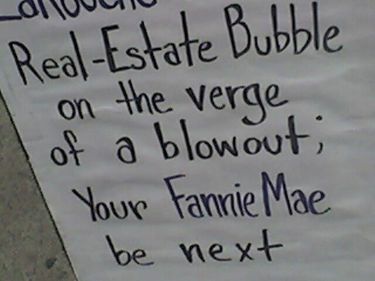 Very few asked an opinion about whether the bubble was going to bust tomorrow or next year. Here in Myrtle Beach, the crummy loans are no more to blame than the buyers themselves. Most of the qualified through conventional means, but they didn't intend to keep the property...they just wanted to flip it. If they got caught at the end, it didn't flip. Now that the value has tanked, half of them are letting them go back just because they don't feel like they should have to keep something that didn't hold its value. That is not the way life is...otherwise every new car buyer would let the car go back because it depreciates immediately. It may not be in small towns, but in resort areas, it was all about greed. The buyers were no less greedy than the Realtors or the developers. And a big part of the bubble bursting can be blamed on all the pundits that kept yelling that it was going to happen. Eventually other investors listened, and it was like a set of dominos. Most of our Realtors here are investors too, and a large number of them have lost or are losing everything they have...foreclosures are just as much in that group as the factory workers. Nobody could predict exactly when it was going to tank, and everyone suffered. Blaming anything on Realtors is being completely unrealistic in my book. It's amazing to me how many people do not want to take responsibility for their own actions. We told people they were buying in a seller's market, and we even had a disclosure in our contracts that informed the buyers that they might be purchasing a property at above appraised value that had to be initialled specifically. That did not stop anyone from buying, including agents. The super rich (who have access to information and resources far beyond any agent or lender), invested billions in projects that went belly up. Jan and Dawn are totally correct - buyer greed, fueled by exhuberant media reports of incredible profits - was responsible for most of the transactions that were closed in 2005. Pointing fingers is easy and hindsight is 20/20. While of course there was definitely abuse on the part of some agents and lenders, I believe that most agents and lenders did the best they could for their clients with the knowledge THAT THEY HAD AT THE TIME. The buyers who signed all the disclosures and contracts need to stand up and shoulder just as much blame as anyone else. And if they took responsibility for their actions - did not walk away from the homes they bought - we would not be in this crisis. I agree that it was human greed, but I'm always amazed that the discussion is always in the context of purchasing homes. Don't forget that a large portion of this mess is from people who didn't buy anything but just refinanced so they could pay off their credit cards and other debts, and then run right out and max out their cards, again. They weren't using caution but just looked at their home as a personal ATM machine so they wouldn't have to deny themselves anything. They closed their eyes and ears to to the fact these loans they were getting were too good to be true. There weren't any Realtors involved in these chains. They went right to the lenders offering these loans. I only had one client ask me about this and it was after the fact, when she called me to tell me about this great loan that would finally allow her to buy the place in the country she always wanted. When I looked at her loan docs and gave there the bad news, she promptly refinanced out of it with a reputable lender I recommended. I don't know that there are Realtors putting guns to peoples heads in bad times anymore than the good times. Buyer's still have to have a brain. It is not up to Realtors to live inside their clients check books.